PERFORMANCE 42 n Performance & Hotrod Business n January 2015 Part and Parcel 'Parts time' work in the old trucks and sports cars business. By John Gunnell L ong Motor Corp. of Lenexa, Kansas, operates a surprisingly big business selling parts for American trucks, British sports cars and Datsun/Nissan models. The company has more than 400 employees who work in shifts that run from early morning until 11 p.m. 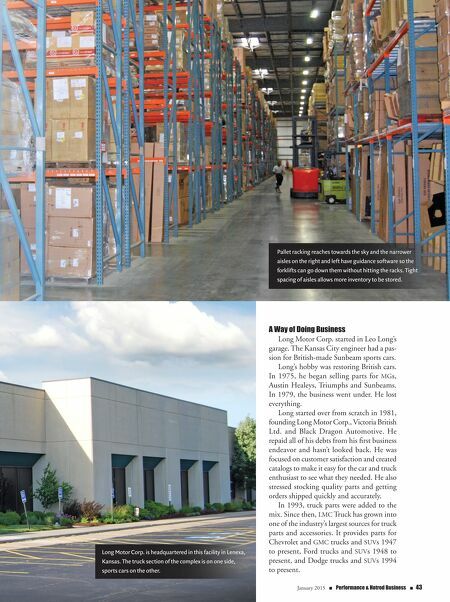 The LMC order-takers and warehouse personnel work into the evening, welcoming new and repeat customers and quickly fulfilling the business that comes in each day with great efficiency. 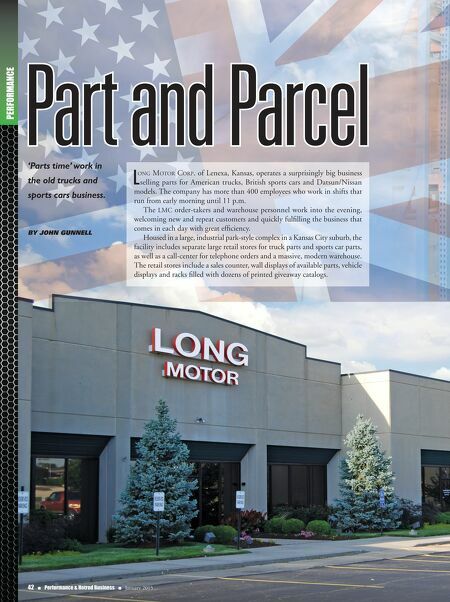 Housed in a large, industrial park-style complex in a Kansas City suburb, the facility includes separate large retail stores for truck parts and sports car parts, as well as a call-center for telephone orders and a massive, modern warehouse. The retail stores include a sales counter, wall displays of available parts, vehicle displays and racks filled with dozens of printed giveaway catalogs.